Every day TipRanks scans the web for recommendations from nearly 4,800 analysts. The best part: TipRanks tracks the performance of these experts and ranks them using unbiased, objective algorithms so investors can follow analysts according to their objectively measured performance. For example, in the screenshot below you can see that Gerard Cassidy is the best analyst on TipRanks out of 4,545 analysts at the time of writing. His 241 recommendations were profitable 88% of the time and he has an impressive 35.4% average return. Short term investors: measure analyst performance by one-month trades. Longer term investors: find the best-performing analysts over 1 or 2 years for example. 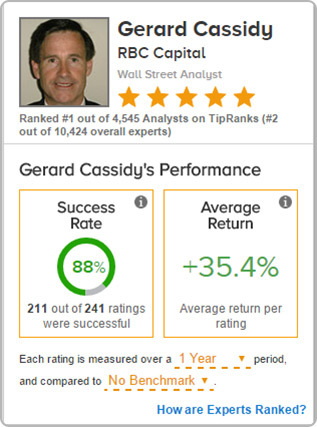 As soon as you click on the analyst’s analysis page you discover the analyst’s ranking and star rating. These two key statistics enable investors to quickly assess how the analyst compares to the other analysts tracked by TipRanks. As a result, they are the perfect indicators of who to track for the most profitable returns. 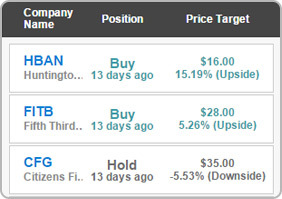 The stock coverage of the selected analyst is displayed in a list similar to the one above. You can see: the company name, position (buy, sell, hold), price target, action (reiterated,assigned, upgraded, downgraded) and the date of the recommendation. Also note the analyst’s best trade and recommendation distribution between buy, sell and hold. See a stock that interests you? 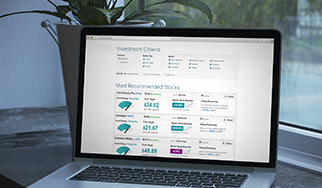 Check out the analyst’s success rate and average return for that specific stock. 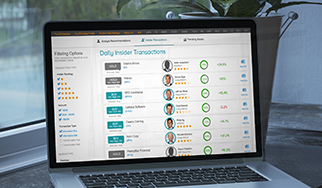 TipRanks tells users whether an analyst is an expert on each stock as well as their overall performance. Perhaps a top-rated analyst has a poor track record on a certain stock or vice versa. 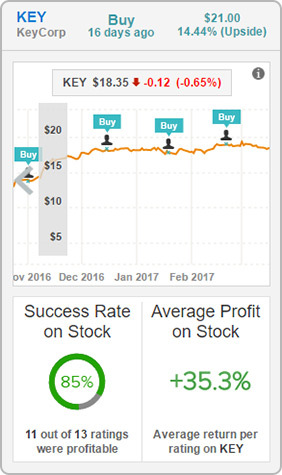 The result: all the analyst’s ratings for that stock are displayed on the graph so you can immediately see the distribution of buy/ sell/ and hold ratings. Here for example you can see that the analyst has become more bullish on KEY over time. Follow the analyst by clicking the blue ‘follow’ button on the top right of the page to stay updated on all the best analyst activity. Have a question about the Analyst Page Tool?